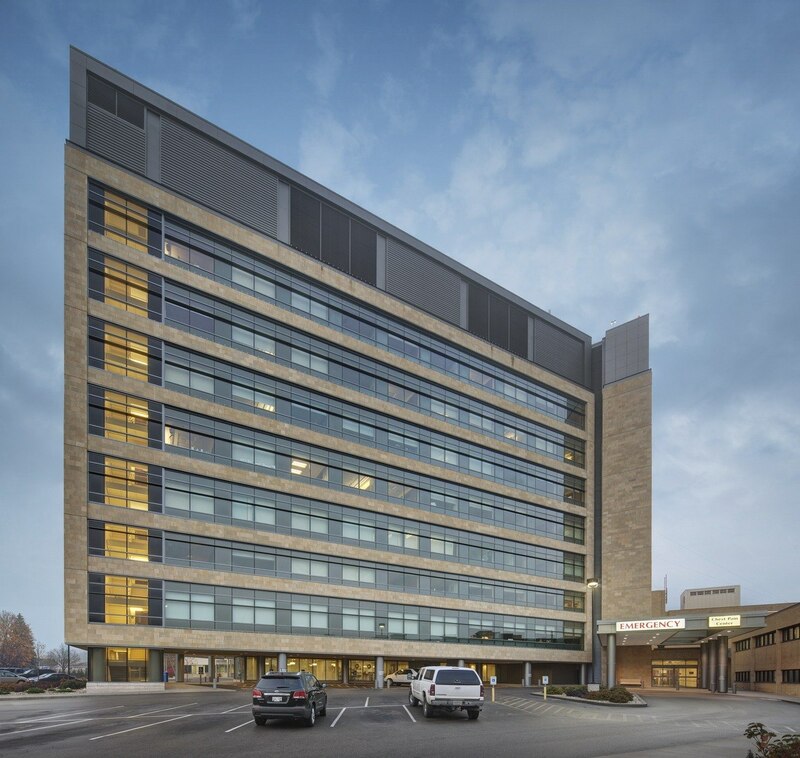 Designed around ThedaCare’s Collaborative Care “Trio” concept—in which a physician, registered nurse and pharmacist meet with patients upon arrival to gather all information—the Appleton Medical Center Bed Tower focuses on workflow improvements and increased patient outcome. The eight-story, 169-bed Inpatient Bed Tower includes 112 private patient rooms, and a full range of clinical and diagnostic services. The Bed Tower features state-of-the-art patient rooms with bedside computers, patient lifts, in-room storage, and continuous handrails to support patient and staff safety; efficient layouts; decentralized nurses’ stations; and deployed supplies to streamline work processes. The triangular building form reflects “travel distance analysis” during the planning process, with the goal of enabling staff to view the greatest number of patient rooms from work hubs. Among the measurable sustainable goals, the building footprint was minimized to reduce disturbance to native soils, plants and animals, controlling erosion; low-flow plumbing fixtures reduced water consumption by 30 percent; HVAC is 26 percent more energy efficient than industry standards; dedicated heat recovery chiller reclaims heat from medical process equipment and reheats it to be used for comfort space conditioning; solar panels used for domestic water heating handles 60 to 75 percent of the annual load; and zoned and task lighting reduces energy needed to light work areas.